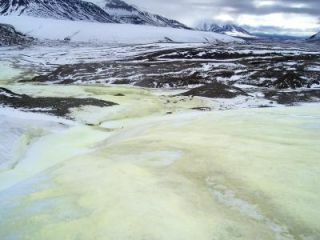 Yellow sulfurous emissions from the Borup Fjord Pass resemble the surface of Jupiter's moon Europa. It’s not easy looking for life on Jupiter’s moon Europa. Just getting there can be a problem. So scientists would love to find a place on Earth that resembles the sulfur-laden surface of Europa. And now they have. In a fjord in Canada scientists found a frozen landscape with loads of sulfur where, conveniently, bacteria reside. It doesn’t mean there are microorganisms on Europa, but the newfound environment gives researchers a place to study in advance of a possible future mission to the icy moon. Astrobiologists have long thought Europa to be a place where life could exist, and experts are eager to mount a mission to Europa to search for life. Ice and sulfur don’t co-exist often on Earth. That makes the location at Borup Fjord Pass in the Canadian High Arctic a special one. Sulfurous yellow emissions contrast with the whiteness of the environment, creating images similar to those captured at Jupiter's satellite. The key finding: The sulfur providing an energy source to Arctic microorganisms has characteristics that could help to detect biological remains on Europa. "We have discovered that elemental sulfur can contain morphological, mineralogical and organic 'biosignatures' linked to bacterial activity. If they are found on Europa, this would suggest the possible presence of microorganisms," said Damhnait Gleeson, lead author of the study and a member of the Centro de Astrobiologia in Spain. Gleeson did the work while at NASA’s Jet Propulsion Laboratory. The 'biosignatures' are associated with certain sulfur shapes in which mineralized remains of microorganisms and extracellular material are visible via electron microscopy and X-ray diffraction techniques. "There is much evidence of bacterial activity," Gleeson said. The researchers wonder if there might be a similar microbial community in Europa's icy crust or the ocean thought to lie beneath it. The study is detailed in the journal Astrobiology.